WOUNDED WARRIOR HEROISM HONOR SACRIFICE POLYESTER BANNER FLAG 29 X 42"
The mission of Wounded Warrior Project is to honor and empower wounded warriors by raising awareness, helping injured service members aid and assist each other and providing programs and services to meet the needs of injured service members. **Please note eBay sellers who list items for sale are not directly associated with WWP; they have chosen to donate a percentage of their sales to this organization. These funds directly support WWP's mission. For more information, visit www.woundedwarriorproject.org. 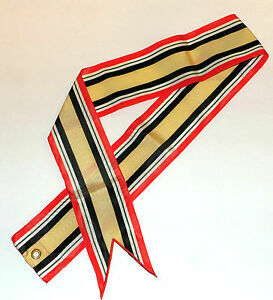 Item: Award Streamer Manufacturer: Ira Green, Inc. These ribbons are great collector items. Thank you for posting them for sale!!! Will fly my OIF Campaign daily. Thanks! New authentic item, fast shipping, great seller!